After my session with Randy on Sunday I met a friend for lunch. He was in town from Lagos for a few days and I was looking forward to catching up with him. We hadn’t met since November and it was the first time in 5 years that we hadn’t had our New Year’s Day dim sum lunch together. We decided to meet at the Dubai Mall. I was there a little early so sat outside watching the fountain (Puccini’s ‘O mio babbino caro’). It was a beautiful day, warm but not too hot, and it wasn’t very crowded being a Sunday. We went to Ping Pong for lunch (just to keep up our dim sum tradition). I hadn’t been to Ping Pong in Dubai and had heard mixed reviews about it. I was pleasantly surprised. As he’s vegetarian we ordered more vegetarian dumplings, but I ordered the prawn and chive dumplings and lobster dumplings for myself. Nothing on their dessert menu appealed to us so we went to the Hummingbird Bakery a few doors down and had a cupcake each. And I wonder why I’ve put on weight recently! To be fair I did ask if they had any mini cupcakes but the waitress said they were special orders only. I walked around the mall for a while and then went home. 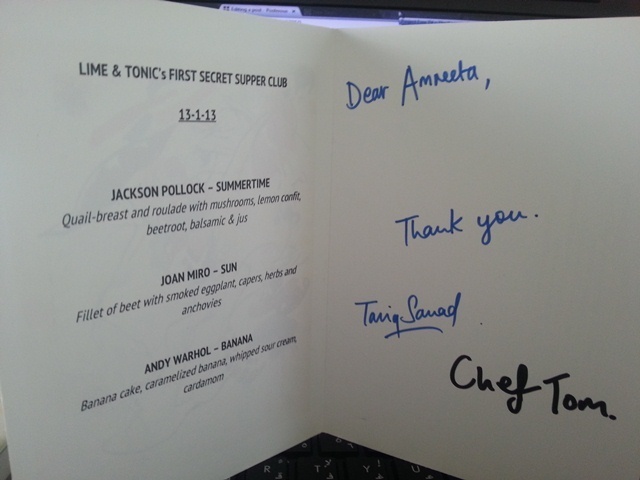 That evening a friend and I had booked to go to Lime and Tonic’s first Secret Gourmet Supper Club. We’d booked it in advance (AED 260) and were told the pick-up spot would be at DIFC. 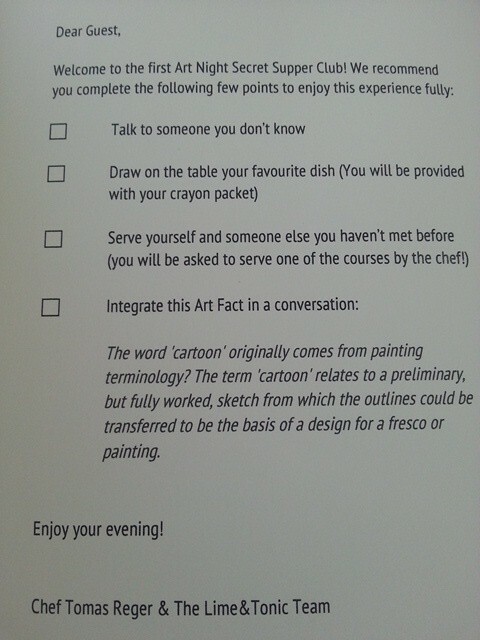 As it was Art Night the dinner would have an ‘arty’ theme to it. About 30 people gathered at the entrance to DIFC and we were led to a coach. We had no idea where we were going. We knew vaguely what we’d be eating as we’d been sent a list of ingredients beforehand so we could let them know if we had any allergies. There would be no alcohol served. About 15 minutes later the coach pulled up outside Sama Tower on Sheikh Zayed Road, between the H Hotel and the Fairmont. 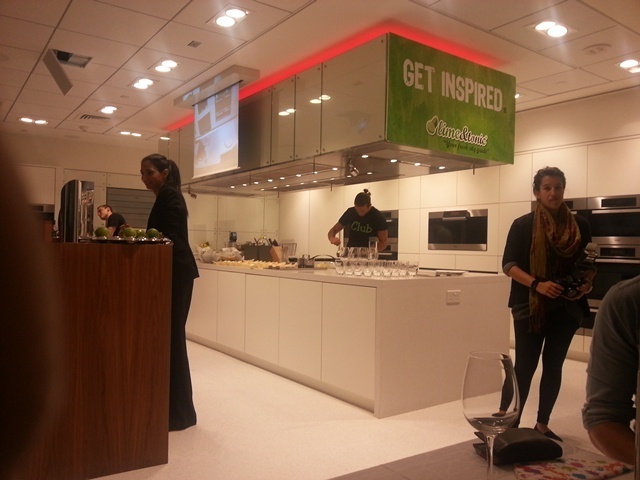 We were having dinner at the Miele showroom! We were given glasses of lime and tonic when we arrived and were shown around the store. We were taken upstairs where they have a space for cookery classes (I’d imagine?) and met the chef who would be preparing our dinner. We gathered around one of the long tables and were told that it would be a very interactive evening and it would be a lot of fun. At that point, all I really wanted was my dinner and the thought of being ‘interactive’ did not appeal at all. I simply wasn’t in the mood. Two long tables had been set and we sat down and waited for our starters. We each had a card with ‘tasks’ listed inside. We were already speaking to people we didn’t know. I had a French/Australian couple on my left and a freelance journalist from the UK opposite me. We started drawing our favourite dishes on the blank placemats in front of us (full English for me, thanks). 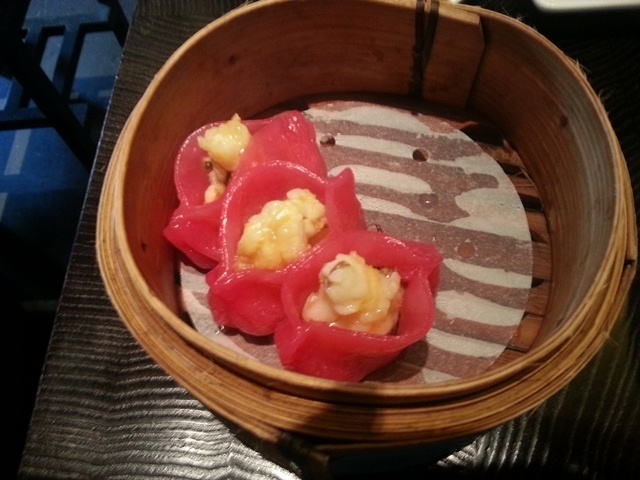 Ten of us were then called up to collect the starters – one dish for ourselves and another for someone we didn’t know. 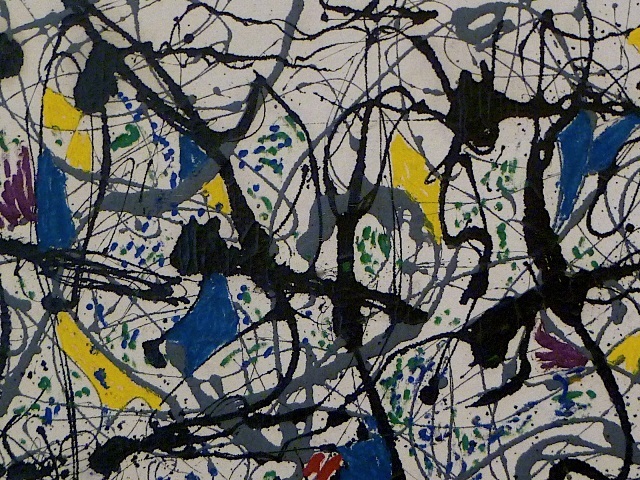 As it had an ‘art’ theme, the starter was based on Jackson Pollock’s ‘Summertime’. It was quail breast and roulade with mushroom, lemon confit, beetroot, balsamic and jus – the four sauces were drizzled over the plate, similar to the painting. I took my portion and an extra and served someone on the next table explaining the significance of the drizzled sauces. When I got back to my seat, the placemats had been turned over and was an image of Pollock’s ‘Summertime’. I thought that was clever. 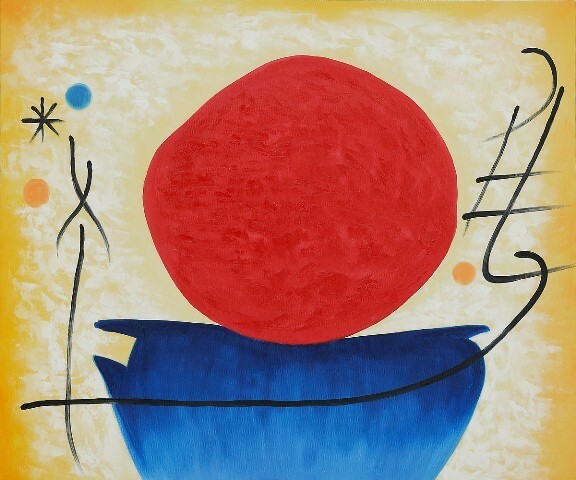 Our main course was based on Joan Miro’s ‘Sun’. Once again, our placemats were changed to match the painting. 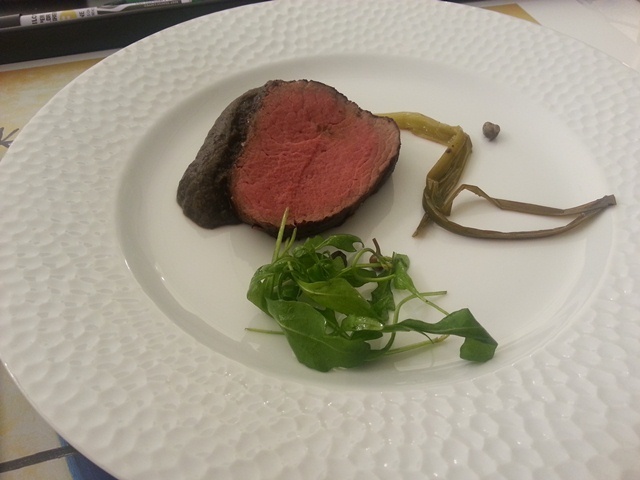 The main course was fillet of beef with smoked eggplant, capers, herbs and anchovies. It was really good – the meat was so tender. For dessert we had banana cake with cardamom, caramelised banana and whipped sour cream. 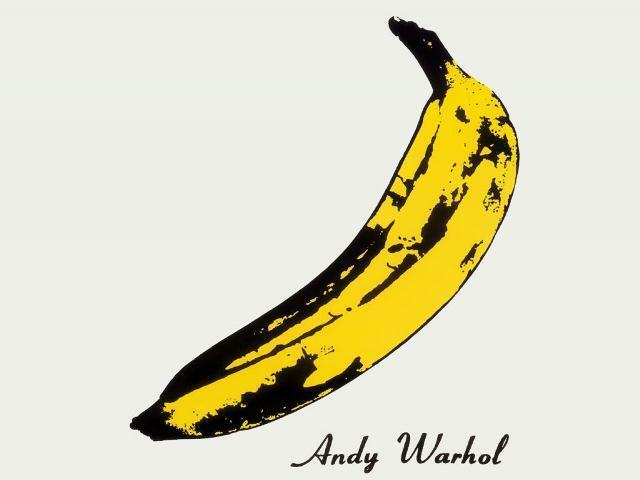 That was based on Andy Warhol’s ‘Banana’. After dinner we were each given a thank you card which listed the evening’s menu. 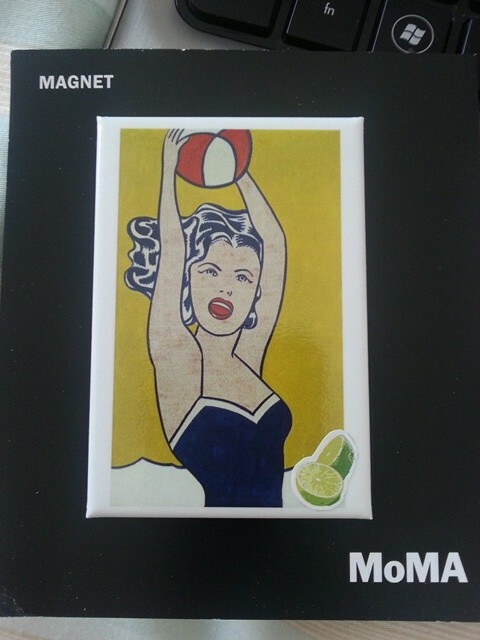 Each card had a little present inside – fridge magnets! Mine was Roy Lichtenstein’s ‘Girl with Ball’. After we said our goodbyes, we all got on the coach and headed back to DIFC. It was a fun evening but I’m not sure how often I would do something like that. Perhaps if I was with a bigger group of friends I’d consider it. On Monday afternoon I had to go back to GMC to see the eye specialist. I was given an eye test (perfect, she said) and she looked at the lump under my eyelid. She gave me a prescription for eyedrops and an ointment, both containing steroids. I wasn’t crazy about the idea but she told me to try it and come back in 3 weeks. That night I met my friend from Lagos for dinner. We went to Zuma. I can’t believe that place is always so crowded, even on a Monday! We met at the bar and ordered a drink – I had the raspberry and passion fruit martini (again). We went down to our table and ordered our food and sake. Most of our food was vegetarian but I ordered the tuna tataki for myself. As always, the food was excellent. And the sake was fantastic too. In fact, we ordered a second flask of sake! After dinner we were joined by one of his Lebanese friends so we hung out at the bar for a while and had a few more drinks. I got home at around 1am. I was home all day on Wednesday and had a piano lesson on Thursday afternoon. I had managed to learn ‘Comptine’ but it still wasn’t perfect and I wanted to record it in my next class. We spent most of the lesson working on something new: Solfeggietto in C minor. I hope I sound as good as that when I finish learning it! That evening my friend from Lagos and I went to Trader Vic’s at the Crowne Plaza Hotel for a couple of drinks and some deep-fried cheese balls. I thought we could get a table and sit down but as we weren’t having main courses we had to stay in the bar area. It was horrible – we managed to find a stool at the bar but it was really smoky in there. We stayed for an hour or so and left. He was heading out for a late dinner and I went home. I was home all day on Friday – I just didn’t feel like doing very much. I had a couple of friends call to go out that evening but I just wanted to be at home. On Saturday afternoon I went back to Gulf Photo Plus as I’d booked a ticket for a seminar on architectural photography. It wasn’t a practical seminar so I didn’t even need to take my camera, just a notebook and pen. Several of the people were architects or interior designers and I thought it might be a bit too advanced for me (I was just curious), but it was interesting to learn how to take photos of buildings and rooms and to get the best shots. The photographer said he spends as much time in Photoshop as he did taking the actual photos. Perhaps I’m just naive but he said that on all hotel websites/brochures, all the photos you see are actually made up of several different shots! I thought that was kind of sad in a way. It’s like finding out Santa Claus doesn’t really exist! I went home that evening and got into bed. I’d been feeling tired and cranky and upset and broke (long story) for the last few days and just couldn’t figure out why I felt so down. What was I doing with my life in Dubai? Would I be better off back in London? All kinds of things were going through my mind. As I was brushing my teeth that night I caught sight of my eyedrops and wondered whether it could be the steroids in the eyedrops that were affecting me so negatively? The percentage of steroids in the eyedrops must be miniscule so it didn’t seem likely, but I actually started to feel better once I had a probable cause of this ‘meltdown’ (to be overly dramatic). And that’s another week gone! I think this year will go by even quicker than last year!